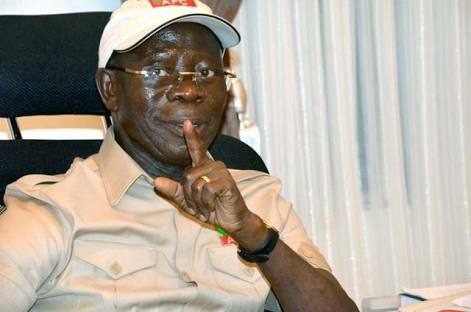 National Chairman for the APC, Adams Oshiomhole, of gathering over $50m from various aspirants amid the last primaries of the party. Oshiomhole through intermediaries from Imo, Zamfara, Adamawa and Ogun states. In a statement on Thursday, Frank threatened to publish the names and the amount of money paid by aspirants to allegedly bribe the former Edo State governor to clear them and substitute the names of duly elected candidates with those that failed. But dismissing the allegations as “unfounded”, Oshiomhole labelled Frank “a political jobber”. Speaking through his Chief Press Secretary, Simon Ebegbulem, he challenged Frank to publish the names of the alleged bribe givers or face legal action. Frank alleged that the DSS had presented its report and findings against Oshiomhole to President Muhammadu Buhari. Frank, however, called on the President to act on the recommendations of the DSS by ordering Oshiomhole’s sacking and prosecution, if his government was actually fighting corruption and not just opposition. He said, “We are in the know that President Buhari has received the DSS report on Adams Oshiomhole and Nigerians are patiently waiting for the action or inaction of his government, because this is an administration that has claimed fighting corruption as an achievement. “In the history of party administration in Nigeria, no party chairman has been accused of collecting the jaw-breaking amount of money allegedly collected within a short period in office like Comrade Oshiomhole has allegedly done. “Instead of Oshiomhole to clear his name, he has taken to a diversionary path, asking the Senate President, Senator Bukola Saraki, to resign. Nigerians are not gullible. We shall wait to see how the acclaimed anti-corruption regime will act on this particular issue.